We want as many people to come to the retreat as possible! is what makes Unschooling Conferences so fun! Please do not let money keep you from joining us! 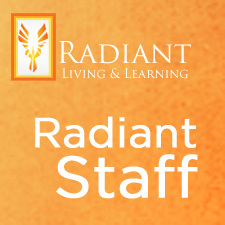 There are many ways you can help out at the Radiant Living & Learning Retreat. If you need help covering the cost of your registration you can get registration credits for doing lots of different jobs before, during or after the event. Below is a sampling of jobs we need to fill, but the best thing to do is contact us so we can discuss your skills, interests and where we can best use your talents. Please submit the Staff Application so that we can match you up with jobs at the retreat. workshop topics, activities we haven’t thought of, etc. Contact Us to discuss ideas. How much credit can I receive for working? Generally we will comp $10 per hour. Some jobs will get more per hour depending on volunteer’s skills and expertise. We will discuss the particular job you are doing, how many shifts you want to cover and determine your discount. It is important that you show up, and be ON TIME to your assigned shift, as all unfulfilled shifts will incur a charge in the amount of credit that was negotiated for that shift. You may trade with another person to get your job covered. Have more questions or want to discuss staff positions? This entry was posted in Fall Retreat, Volunteer Opportunities and tagged 2013 Fall Retreat Info, Self-Directed Learning, Unschooling, Unschooling Conference, Unschooling Retreat by christinawester. Bookmark the permalink.